We’re very British, we really don’t like blowing our own trumpet. 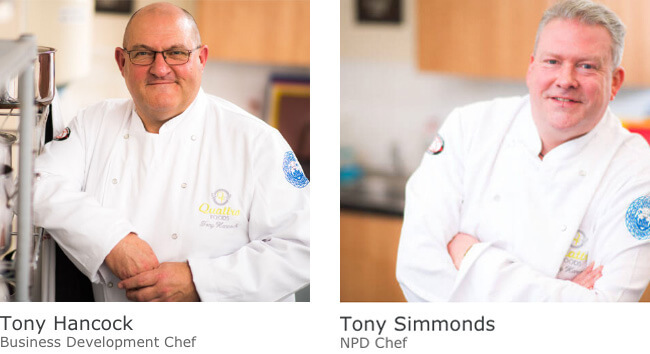 But when it comes to our talented Development Chefs, Tony Hancock and Tony Simmonds, fondly nicknamed Tony 1 and Tony 2, we find ourselves fawning. Not only do they have a penchant for combining outstanding flavours to create deliciously appetising sauces, they’ve got a charming way with our customers, and work closely with them as a team to create exactly the right food for their own customers who come to Quattro Foods for premium food manufacturing and that’s what they get! It’s not easy to pin either Tony down. Busy chefs in a bustling commercial kitchen find it hard to tear themselves away from the sizzling and the spicing – but we did it. Bribed with a plate of mince pies, we lured both Tonys out of their frenetic kitchen for a whole 20 mins to answer some questions designed to help you, our loyal customers and readers, get a flavour of life in Quattro Foods’ development kitchen. We wanted to demonstrate the life cycle of a project, from the initial customer enquiry to the finished product. If you’ve ever wondered how our food manufacturers find inspiration for their dishes, source the freshest and tastiest ingredients or deal with customers on a day to day basis, read on. Q. How does the Quattro Foods team react when a lead comes in? A. The first stage is to get a complete view of the customer and the project. We contact them immediately with relevant questions, and once we have all the details we arrange a meeting to formulate a way ahead for the new concept or recipe. At this stage we map out our food manufacturing journey and put in place a bespoke plan. Every enquiry varies significantly which is the beauty of the job. For a chef, the challenge of creating something different is a highlight. We never know what the customer will ask for – and we also don’t always know what we can do until we try. We’ve had a huge amount of fun trialling new products and processes over the years, as well as tasting hundreds of delicious recipes. We never know what can be achieved until we put our minds to it and we thrive on challenges – the more daunting the better. There are many things to consider, such as new ingredients, different or complex operational issues and, of course, cost and commercial viability. Q. What’s the ratio of bespoke to ‘off the shelf’ enquiries that Quattro Foods receives? A. About 99% of enquiries are bespoke with the occasional customer asking “do you do an off the shelf soup or sauce?” Everyone is looking for something made especially for them, to allow them to stand out in the throng and shine in a pretty crowded food market. Q. What steps do you take to confirm requirements? A. Initially we go through the recipe or concept with a fine toothed comb before we go back to the customer with further questions. Only once we agree and feel we’re on the same page do we forge a way ahead and a put a plan of action in place. This can involve any number of phone calls and emails. It’s crucial that we communicate fully. Then we sign a non-disclosure agreement; conduct crucial research; source new ingredients and discuss technical and operational processes. Then comes the most exciting part – gathering the ingredients, cooking the first sample and getting it sent out to the customer for the first tasting session and feedback. And finally we take the plan to the kitchen and crack on with creating, chopping, peeling, combining and cooking. Q. Does the customer get to taste samples? A. The customer always gets to taste samples throughout the process, all the way up to final sign-off. In fact, many of our customers tell us this is their favourite part of the project! When they try to persuade us of the merits of their granny/neighbour/niece having a taste we start to get suspicious…..
Q. How many tweaks are usually required before a product is perfect? A. In an ideal world……only one! In the real world, usually 2 or 3 rounds of amendments, unless the product is very complex, then it could be even more, but we keep going until we get the result the customer is looking for – with not an ounce of compromise. No wonder they call us perfectionists! Q. What’s the sign-off process? A. We only reach the end of the road when everyone is happy, especially the customer. Recipe agreed; commercials agreed; specification agreed; packaging agreed; format agreed; recipe and production process agreed and written and the Quattro Foods team briefed. Job done! Q. What experience or personality traits are required of you both as Development Chefs? A. Experience of fine cuisine from around the world and across the seas is a prerequisite, as is a strong background in varied areas of the food industry from fine dining to bulk cooking. In a frenetic kitchen, a touch of humour also helps! You might say even being a tad moonstruck makes us good at our jobs. You also need to have stamina and be a bit of a deadline junkie. And of course a passion, bordering on obsession, with food. Q. How much creative license do you have when designing food products? A. It all depends on the brief from the customer, but along with the skills to turn a kitchen recipe into a factory workable recipe many times over, we are able to be as creative as we need to be, job by job. 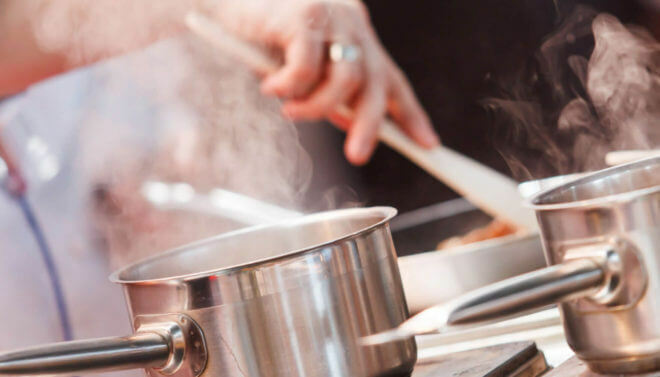 As a Development Chef in a major food manufacturing business you must be able to turn your hand to most things and make a basic recipe idea into the best the customer has tasted. We thank both Tonys for their time as they saunter back into their culinary sanctuary to continue creating colourful, flavoursome and innovative food products for our customers. These two Development Chefs embody the Quattro spirit with their passion for food (and mince pies, apparently).